Some directors reinvent genres; other directors have a vision that is so specific and gigantic that they create their own. Robert Altman is one of those directors. In films as outwardly different as M*A*S*H, Brewster McCloud, Nashville, Buffalo Bill and the Indians, A Wedding, Health, Short Cuts, Gosford Park, and A Prairie Home Companion, Altman invents and perfects a genre totally unto himself: non-linear, tapestry-like, epic, rambling, multi-tiered, literary, improvisatory, and unique. Nashville is the most successful of these terrific Altman films: it has the best cast, it has the best music, and it has the most to say about a very specific part of America. Written by Altman and Joan Tewkesbury with plenty of room for the actors to improvise business and dialogue, the film captures the essence of this country like few other films. Altman’s Nashville is by turns sprawling, hopeful, joyous, lost, alone, unaware of its own irony, and irretrievably sad. You know—‘Murica! The Plot in Brief: The film follows 24 characters in the titular city. Country music superstars Haven Hamilton (Henry Gibson) and Barbara Jean (Ronee Blakley) consider appearing at a political rally for “Replacement Party” presidential candidate Hal Phillip Walker. Walker’s campaign manager John Triplette (Michael Murphy) tries to line up other Nashville talent to appear: the folk trio Bill, Mary, and Tom (Allan F. Nicholls, Cristina Raines, and Keith Carradine, respectively); Connie White (Karen Black); and Tommy Brown (Timothy Brown). During the next five days, the audience is introduced to other Nashville regulars and hangers-on. Barnett (Allen Garfield) is Barbara Jean’s husband and manager; he is in a near-constant state of apoplexy. Lady Pearl (Barbara Baxley) is Haven Hamilton’s constant companion. Del Reese (Ned Beatty) is a lawyer and a local campaign worker for Hal Phillip Walker; his wife Linnea (Lily Tomlin) ends up having a one-night stand with Tom. Wade Cooley (Robert Doqui) is a restaurant short order cook who tries to persuade waitress Sueleen Gay (Gwen Welles) that she is not a talented singer; she refuses to listen to him. More things happen, as they do in Altman films: Opal (Geraldine Chaplin) is a reporter for the BBC; she will also have a one-night stand with Tom. Albuquerque (Barbara Harris) has just left her husband and wants to be a country music star. Mr. Green (Keenan Wynn) maintains a vigil at the hospital bedside of his dying wife. Green’s niece Martha (Shelley Duvall) has come to visit her dying aunt; Martha has changed her name to “L.A. Joan” and is more interested in the Nashville music scene than her dying aunt. Martha/L.A. Joan will also have a one-night stand with Tom. Why do all these different women have one-night stands with Tom? Simple. “I’m Easy,” sings Tom over and over in the film’s Academy Award-winning song, which Carradine wrote and performed himself. To say that Robert Altman had an instinctive eye for acting talent is an understatement. 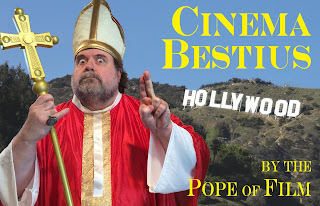 The Pope is not shy about expressing his love for great character actors. With no one story line taking precedence, Nashville essentially features an entire cast of supporting parts—or 24 leading roles, however you would like to look at it. Besides the actors mentioned in the longish (though far from complete) plot summary above, we see early work by Scott Glenn and Jeff Goldblum. Nashville also features the first film performance by Ronee Blakley; she was nominated for an Academy Award. “Who do you think is running Congress? Farmers? Engineers? Teachers? Businessmen? No, my friends, Congress is run by lawyers. A lawyer is trained for two things and two things only. To clarify—that's one. And to confuse—that's the other. He does whichever is to his client's advantage. Did you ever ask a lawyer the time of day? He told you how to make a watch, didn't he? Ever ask a lawyer how to get to Mr. Jones' house in the country? You got lost, didn't you? Congress is composed of five hundred and thirty-five individuals. Two hundred and eighty-eight are lawyers. And you wonder what's wrong in Congress. No wonder we often know how to make a watch, but we don't know the time of day. “Does Christmas smell like oranges to you?" A candidate who is popular simply for being contrary and shallow, artlessly criticizing the governmental status quo? Whose appeal is based on “saying what everyone is thinking” and proposing simplified but radical ideas? Sure sounds like Nashville, made 41 years ago, bless its soul, predicted our current political climate. Nashville’s Three Miracles: 1) Altman’s pioneering sound recording method, which mikes and records each actor separately, allowing Altman to “mix” the resulting vocal tracks during editing (more like a musical recording than a movie soundtrack) for a layered effect that captures the overlap and spontaneity of real conversation; 2) the film’s terrific songs, all of which were written by the actors themselves: Carradine’s Oscar-winning “I’m Easy”, the upbeat and hilarious “Two Hundred Years” and “Keep ‘A Going” by Henry Gibson, and the anthemic-yet-resigned “It Don’t Worry Me”; and 3) the sophistication of the film critics and the movie-going public in 1975 that made this film a hit. Nashville presents, perhaps better than any other film, the oxymorons that define American life: tearful celebration, relentless optimism, humble heroism, genuine irony, both epic and personal in scale. Altman’s masterpiece is at once “of its time” and “for all time,” detailing the dreams, conflicts, desires, and realities of a deeply divided country. This is a wonderful movie. My favorite moment is the impromptu concert Barbara Jean gives midway through the movie (the above picture shows it). She sings a fast song, a lovely slow number (I believe it's called "Dues"), and then starts a third when...she slowly breaks down. It's a harrowing moment where Barbara Jean keeps starting the song and then stopping, and we're watching a woman falling apart on stage. Barbara Jean's brilliance and fragility are wrapped up in that incredible sequence. Criterion's Blu Ray is another milestone for them.